SF Taxi Media: Commentary On Supervisor David Campos' Resolution Urging MTA To Reconsider 5% Credit Card Fees. By John Han. Commentary On Supervisor David Campos' Resolution Urging MTA To Reconsider 5% Credit Card Fees. By John Han. 5% credit charges onto drivers. Photo by John Han. The San Francisco Board of Supervisors is expected to vote on a resolution next week urging the Municipal Transportation Agency (MTA) to "reconsider" a policy that allows 5% credit card fees to be passed from cab companies to cab drivers. The Board's three person Government Audit and Oversight Committee voted 2-1 in favor of the resolution last Thursday, and is now expected to go to the full Board at its regular meeting on Tuesday, October 25th, 2011. The resolution, introduced by Supervisor David Campos, would be non-binding should it pass next week, because the Board of Supervisors does not regulate the taxi industry. The MTA does. The resolution urges the MTA to, "reconsider and abandon the decision to shift the burden of credit card merchant charges to the city cab drivers", citing that it overturns an existing transportation code forbidding such practice, and that it would be "unfair" to pass such legitimate costs of doing business onto the industry's workers... workers who typically do not have benefits or pensions. The resolution includes other reasons and may be read in its entirety by CLICKING HERE. During last week's committee meeting, Supervisor David Campos expressed three key reasons for introducing his resolution. In the following text I, (apologize for its length), elaborate and assess Campos' ideas. The ability to legally pass credit card fees onto taxi drivers may hinge on their legal classification as independent contractors. Because, by California's laws, these fees could not be passed onto employees. But despite the independent contractor status, the actual nature of taxi work itself can, in significant ways, function more like a company hired worker rather than a business owner, since most taxi drivers are not permitted to own their own cabs. This is evidenced by the fact that State law requires San Francisco cab companies to provide Workers Compensation for its gate and gas taxi drivers. 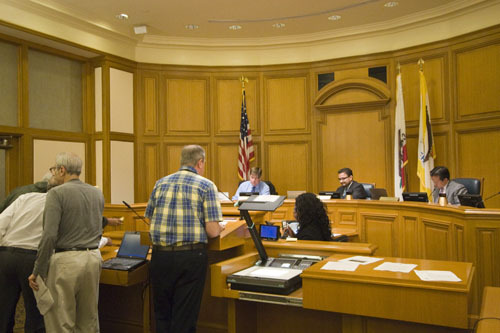 It is unclear whether the City and County of San Francisco itself, which requires Workers Compensation for its taxi drivers, does so on its own independent accord, or if it is simply doing it to be in compliance. This means most cab drivers are beholden to the companies they work for and can be hired and fired by the cab company through application, interview, and background checks, cannot set their own shifts but must work the company shifts instead, and must often tip and wait long periods every night to get their cabs assigned to them by the company's cashier. Therefore they do not possess the adequate, autonomous control over their "businesses" that they are said to "own" in the same way that others who are self-employed can. San Francisco taxi driver Dave Schneider, during public comment, compared the employee-style nature of taxi drivers to waiters, (despite the independent contractor status of drivers), saying that by contrast, laws would not permit restaurants to pass credit card fees onto their waiters and waitresses. The resolution is not a debate over whether taxi drivers should push to reclassify as employees. However, it is unquestionable, and I emphasize unquestionable, that good policy requires recognizing the important nuances and the challenges posed to the taxi industry, whether under independent contractor status or employee status. Campos understands this dilemma, as does Supervisor and Board President David Chiu seem to. Recognizing this, Campos reasoned that the City's taxi policies should not be constituted strictly by its legal definitions, but also by fairness and equity. One of the most compelling moments (at least I thought) occurred when the supervisor shared a Q & A with MTA Deputy Director of Taxi Service Christiane Hayashi, who was invited to come up and speak. Campos asked Hayashi about the legality of passing credit card fees onto drivers vs. the fairness of it. He called the San Francisco's taxi drivers "workers" rather than 'small business owners', or 'proprietors', or 'contractors', etc. And given the nature of taxi work, asked why it's different from a restaurant passing credit card fees onto its wait staff? Hayashi, an attorney, replied, "In an employment situation you have one set of circumstances, and in an independent contractor situation you have another." Campos: "But that's a legal consideration. I mean, the analysis of whether someone's an independent contractor and say one's an employee, that's a legal analysis. But from a public policy standpoint, from the City's perspective, you know you're still talking about workers. So what's the policy rationale for the distinction of the two cases?" Hayashi: "That's the only policy distinction I can make between those two cases." The reason Campos' question is compelling to me is because it demonstrates that there are those within local government who can recognize that the taxi industry is not as black and white in its nature as legal definitions perhaps could deem it to be. That a supervisor knew to ask this question is stunning. Hayashi's answer to Campos may be equally stunning. On whether 5% credit card fees could be unfair to cab drivers, she said it is uncertain if it's fair or not, since no one truly knows how much cab drivers earn, except the cab drivers themselves. "The fact is we have no information on that. We can only rely on self reporting and I suspect that the self reporting is low", she said. She briefly eluded to the MTA's previous efforts to implement electronic waybill tracking (which in part, was originally intended to document drivers' incomes for research purposes, but it was rejected by the majority of drivers as invasive, and protests were held). Hayashi said that the MTA is currently reevaluating its credit card policy and has hired a consulting firm to conduct a study for the agency. She said the results of that study should be expected, "any time now". She also said that when the original credit card fee waiver was passed, certain things didn't exist then that exist now. For example, back then there was no federal law that allowed businesses to impose a $10 minimum for credit card purchases, but there is now, and that that could help in the policy's reevaluation. "I think the 5% fee seems pretty high given what we have heard, and I have heard not only in this meeting but outside this meeting about what it actually costs to make these transactions happen. So I understand why the MTA did what it did. I don't believe that this has been as well thought out as it needs to be." Not all of the 5% goes towards paying for processing costs... or a cab company's card related customer service costs... or a $50 guarantee to the driver if the card declines (which is a good feature). Despite those costs, a percentage still goes to pay for the equipment to be installed in the rear seats of the taxicabs. Perhaps with the exception of Yellow Cab, rear seat terminals play advertisements that generate revenues split between the cab companies and vendors, but not the drivers. (Unless you consider the 10% of excess revenue after equipment purchase, installation, and maintenance going to the Drivers Fund to be a fair revenue split). This specific fact has been was downplayed by cab companies during public presentation. They prefer to say that vendors such as Verifone and others will cover equipment costs. That's true but only in a certain way. Verifone and the like vendors get the 5% fees from the drivers. A percentage of that fee above the normal processing costs is supposed to go towards equipment purchase, installation, and ongoing maintenance. So the drivers are paying for the equipment costs, not the vendors. The rate is set higher at 5% in part to accommodate the equipment purchase. And, while some might disagree, in my opinion, the MTA has tried to downplay this fact from the drivers as well, while pushing the waiver forward. "Even if you try to enforce this, and make sure that something like this doesn't happen, that you are going to have situations where a customer gets on a cab and there is that argument or discussion about whether or not that person will be allowed to use a credit card. And I do believe that we have a responsibility to make sure that the customer experience is as good an experience as possible." - It is said that despite the due public process, the credit card fee waiver was passed with little notice, if any, going out to the greater, vast numbers of affected industry stake holders, specifically the drivers, thus inhibiting more well rounded input in developing new credit card policies. One member of the taxi industry complained that although the MTA made efforts to notify drivers of meetings for gathering feedback, the meetings were only held after the policy had already been approved by the MTA, thus giving a mere appearance of having first consulted with drivers. - Despite that the current policy allows drivers to use alternatives such as SQUARE, which charges 2.75%, an attorney from the Asian Law Caucus said during public comment that the non-profit has received complaints from drivers that their cab companies are not allowing them to use the app. Also, Charles Rathbone, manager of Luxor Cab, has numerous times addressed the Taxi Advisory Council. complaining about Luxor drivers using i-Phone apps like SQUARE. Thus, indicating that at least one major cab company may be trying to use government to discourage using SQUARE. - Cab companies say they are already invested in the technology, software, and contracts with vendors, etc., in order to comply with the MTA's regulations regarding passing credit card fees onto drivers. They say that to rescind the requirements now, and go back after the investments have been made now, would mean a financial loss to companies in those respects. - Cab companies say most cities in the U.S.A are allowing cab companies to pass credit card fees onto their cab drivers. So it is normal. While public comment was allowed at last week's committee, it is said that no public comment will be allowed at the full Board meeting. Not mean it is ok. In addition , what may be legal in some states is not legal in others! The proper way to fix a job with no benefits or even ability to save is to allow the drivers to earn through regular competitive raises, and through actual benefits such as the medical coverage THAT THE DRIVERS ARE LITERALLY OWED BY LAW. It is not proper for the cab companies to pay the fees since the individual fares are not actually part of their business. Saying the companies should pay the fee because the drivers don't have promised benefits and earnings increases may make "intuitive" sense, but the justice of the situation would be easier to quantify if the drivers' interests were not making a money grab based on what is, to be sure, a generally unfair situation. Neither side should engage in money grabs. The companies should give the drivers the benefits they are owed, and the drivers should pay for the transactions only they benefit from.